A griot (pronounced GREE oh) is a West African storyteller, singer, musician, and oral historian. They train to excel as orators, lyricists and musicians. The griot keeps records of all the births, deaths, marriages, and cultural tradition through the generations of the village or family. The griot legacy stretches back for hundreds and sometimes thousands of years. A griot is very important since the history of a family may never be written down. At times the griot may be called upon to to advise people and even give spiritual counsel. Other names for a griot are djeli (Bambara and Malinki languages) and jeli (Mandinka). The griot originated in the 15th century from the Mandinka empire of Mali. Up through the 19th century griots have told and retold the history of the empire through generations keeping the stories and traditions alive. 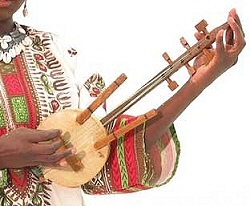 Traditionally, a griot accompanies their stories and songs with a kora. A kora is a 21 string lute which sounds like a melodic harp. A griot trains for years learning to play the kora and listening to elder griots telling their stories. Griots today are not necessarily born into the griot tradition. They often sing songs telling stories of their cultural heritage and traditions. Griot music groups are formed and music such as blues, jazz, and rock are incorporated into their music. Griots also are advisors when there are problems between people including other villages and tribes. Their job is to negotiate peace. The griot's intimate knowledge of the past history of his tribe is very useful in broking peaceful relationships. A side note: There is a rapper called "Griot" from Switzerland. However, his music isn't in the West African griot tradition. The kora and other musical instruments can be purchased from AfricaImports.com.